With an emphasis on the qualities that have fostered strong nursing leadership, this book provides a unique perspective on the lives and achievements of the most revered nurses throughout history. 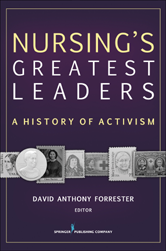 It is comprised of biographies of many of nursings most important activist agents of change, with a focus on those characteristics that enabled them to accomplish their goals and implement changes that improved nursing, health, healthcare, and society. Why Study Exemplary Nursing Leadership Within the Context of Nursing History? What Is Leadership and What Is Exemplary Nursing Leadership? What Is the Difference Between Nursing Leadership and Nursing Management? What Are the Essential Traits or Characteristics of Exemplary Nurse Leaders?